Adopted on July 1st, 1971 for national and civil usage, the flag was designed by a 15 year old school girl who won a nationwide competition held for a new flag design. In the fly you see the Southern Cross, which appears in the flags of Australia and New Zealand (Australia and Britain ran the place- first Papua from 1906-1949 and then New Guinea from 1914-1949 and finally the two together as Papua New Guinea from 1949-1965. It became an Australian Trust Territory from 1965 until independence in 1971.) 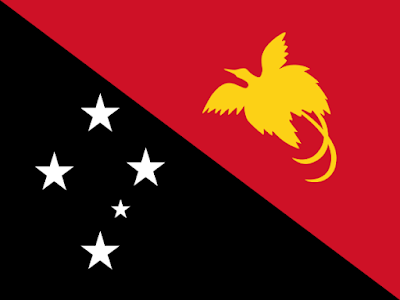 The constellation in this flag represents the country's location in the Southern Hemisphere and that it can be seen in Papua New Guinea. The bird silhouetted in yellow is a raggiana bird-of-paradise, which can be found on the islands and the red and black have long been traditional colors of many tribes in the country, but also hearken back to the flag of the German Empire, which colonized New Guinea in 1899 and whose rule lasted until the end of World War I in 1914. Post-independence, Papua New Guinea settled into it's role as a Commonwealth Realm, which means that Queen Elizabeth II acts as it's head of state. But there's a slightly unusual twist with Papua New Guinea: along with the Solomon Islands they are the only the two Commonwealth Realms whose Governor-Generals are elected by the legislature. The political system seems to have gone through some growing pains before some voting reforms stabilized things somewhat- and a breakaway movement on Bougainville Island resulted in a last minute change to the 1975 Constitution which granted regions quasi-Federal Status- that's quelled round 1 of that uprising, but another revolt broke out in 1988 and claimed 20,000 lives before being resolved in 1997. A referendum on independence for Bougainville is scheduled for 2020- so stay tuned for that. And that's Papua New Guinea in a nutshell!